Don`t miss out on the opportunity to acquire this stunning dormer style residence situated in a tranquil scenic location. 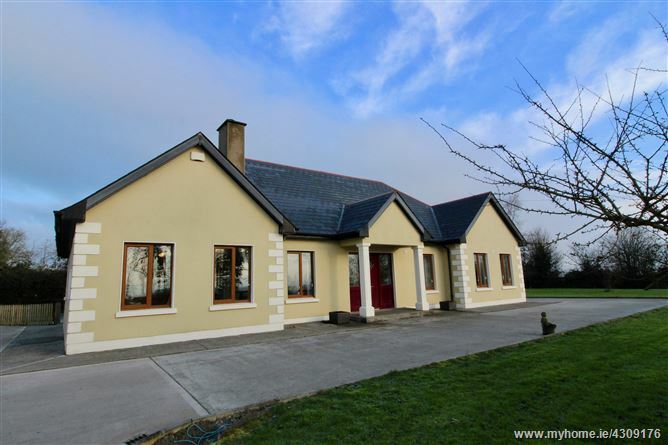 Property is a 25 minute commute to the outskirts of Limerick City, 10 minutes from Croom & Charleville and 5 minutes from Granagh and all its amenities. It stands on C.1/2 acre site. Property features include: feature cutstone fireplace with stove insert, fitted kitchen with double doors leading to rear, master bedroom with built in wardrobes and ensuite, office, oil fired central heating, coving throughout, uP.V.C. double glazed joinery, fully alarmed, landscaped lawns to front & rear, concrete drive to front & rear with brick paving to rear and has a stud railing surround. Accommodation consists of: Entrance Hall, Kitchen/Dining Area, Sitting Room, Utility/WC, 5 bedrooms (master ensuite), Main Bathroom, Shower Room and Office. Driving out Cork road from Limerick take right turn at O`Rourkes Cross for Newcastle West. Approximately 3 miles back take a right (directional sign). Take 1st right on this road and property is 1st on left hand side. Dooley sign thereon. VIEWING: Viewing strictly by appointment with the selling agent.